Performances from My Chemical Romance, as well as Nicki Minaj and Lil Wayne are set to air as a part of NBC's New Year's Eve With Carson Daly special. The show will also feature an interview with U2's Bono and The Edge. Earlier this month, My Chemical Romance fans were offered a chance to be at the taping of the MCR performance that will air, which was recorded on December 6 in NYC's Rockefeller Plaza. 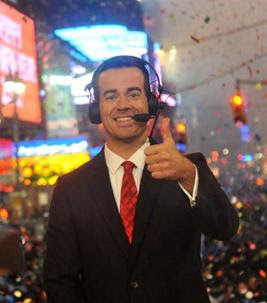 The program will begin at 10 p.m. EST on December 31. I'd like to make a note of apology for not keeping as updated as usual. My grandmother is currently very ill, and it's hard for me to keep a steady connection to the online world. Next week, I will return to my University home and things will be back on track. For now, I still am able to update Twitter quickly. I usually post MCR news as soon as I hear about it via my @PoisonAndFire account, or my @MyChemChat account. I hope your holidays have been great! 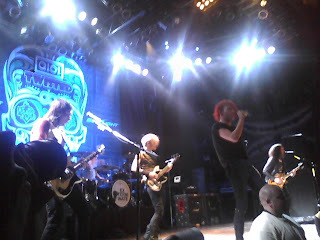 UPDATE: Thursday, January 6 at 7:18 a.m.
December 15th’s My Chemical Romance show at the House of Blues in Chicago was the first MCR show for which I have ever not lined up at least somewhat early. I can’t say I enjoy that not-line-waiting sensation because I do so love waiting and meeting people and feeling like I’ve been through a battle to get to the front row of a crowd. Shows become war-zones and one must fight for his or her survival. However, after figuring out that my meet-and-greet with the band would take place as the doors opened for the show made me a long wait could be fruitless. However, there were many who braved the cold and who eventually got to wait inside for that amazing chance to see MCR up-close, including Paloma Pérez, 20, who flew in from New Mexico just for the show! My Chemical Romance and Best Buy are offering fans $4 off Danger Days: The True Lives of the Fabulous Killjoys. For any fans who have yet to buy the album and are looking for a discount, all you need to do is "like" My Chemical Romance on Facebook, print the .PDF Best Buy coupon that appears and present it at the store when you check out! The offer lasts until this Wednesday, December 18. Not sure if you want the album? Check out my track-by-track [p]review. NOTE: the image that accompanies this post IS NOT the full coupon. 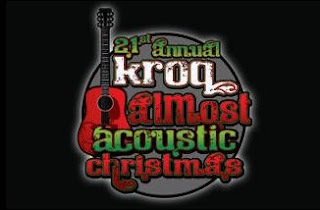 My Chemical Romance are set to perform tomorrow, December 11, at KROQ's 21st annual Almost Acoustic Christmas show in Universal City, California. However, fans who cannot attend the performance will also be able to watch the band perform through KROQ's Ustream channel. Tune in there tomorrow at 9:25 p.m. PST (12:25 a.m. EST) to watch MCR perform live! Spike T.V. 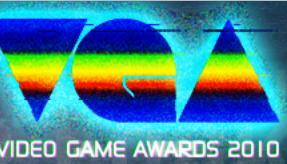 's 2010 Video Game Awards will feature a performance from My Chemical Romance. The awards, hosted by Neil Patrick Harris, will air on Spike tomorrow at 8 p.m. EST. The award show highlights the best in video games from the past year. My Chemical Romance's "Planetary (GO!)" from Danger Days: The True Lives of the Fabulous Killjoys is featured as the lead track for the driving game Gran Turismo 5. My Chemical Romance have been doing many video interviews lately. A majority of them tend to cover topics I have already posted about here; so, I have not been posting them all individually. Here are some of the interviews the band has done recently to help you get caught up! My Chemical Freak | You're Not In This Alone | Drinking Souls | @MCR_FANS -- for helping jog my memory! Often, I post links to such interviews on Twitter. You can follow me at: @PoisonAndFire or @MyChemChat to keep immediately updated on these smaller things! In addition to these videos, fans can also see Billboard's behind-the-scenes footage from the interview by downloading the AT&T Code Scanner App and following the instructions at the top of this article. Tomorrow, December 2, at 5:30 p.m. EST Billboard.com will broadcast a live Q&A session with My Chemical Romance. Fans can submit questions for the Q&A by sending them to @billboarddotcom on Twitter and adding the hashtag #bbmcr! Following the U.K. run of their 2011 World Contamination Tour, My Chemical Romance is set to tour Europe's mainland. I just wanted to check in with a little site change! It's actually not going to affect you or the blog too much, but if you'll look up a little bit, you'll see that whereas you may have seen http://venomousformaldehyde.blogspot.com before, you now see http://cassiethevenomous.com. I've been wanting to change my URL for a while to make it easier for you guys to find the site and to make it look better on those dreaded resumes and internship applications I will be filling out soon. I noticed that many of you started calling me "Cassie The Venomous," and thus- CassieTheVenomous.com is where you will now find this blog! No worries. All the old, familiar content is still here, and you can still find my blog under its old name. There are a couple bugs when you use venomousformaldehyde.blogspot.com, such as the Twitter feed at the top's not showing up and the reader list not showing up on the side, but it's not so bad.